The Metropolitan Opera National Council Kentucky District is part of the Central Region for the 2018-2019 season. The fabled stage of the Metropolitan Opera at Lincoln Center in New York is the desired destination for all young singers participating in the Metropolitan Opera National Council Auditions. Winning the Kentucky District competition – and being rewarded a ticket to the Central Regional Finals – is the first hurdle to overcome in this career steeplechase. Since the beginning of the new millennium, Lexington serves as the Kentucky starting point for the thrilling annual ritual to discover the most promising new opera talent in North America. The Kentucky District Metropolitan Opera National Council Auditions, sponsored by the OperaLex are open to eligible singers from all over the country and Canada. We invite you to make your not so impossible dream a reality with an impressive appearance at the Kentucky District Auditions. You can trust the experience of our judges and be assured that you are welcomed with open arms. To discover exceptional young talent and provide a venue for young opera singers across North America at all levels of development to be heard by representatives of the Metropolitan Opera and to assist those with the greatest potential for operatic careers. The auditions are held annually in thirteen Regions of the United States and Canada. There are forty Districts within these Regions, each providing an opportunity for talented singers to enter the auditions at the local level. The auditions are administered by MONC volunteers in each area. 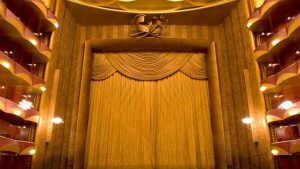 Many of the world’s foremost singers have received awards from the MONC and over 100 former auditioners appear in Metropolitan Opera productions each season. The MONC Auditions Semi-Finals and Grand Finals Concert take place at the Metropolitan Opera House. At that time, the first place winners of the thirteen Regions are brought to New York for musical preparation under the guidance of the Met staff. They then audition with piano on the Met stage before members of the Met artistic staff and other invited opera professionals at the National Semi-Finals. Those not selected as National Finalists receive a cash award of $2,500. All National Finalists remain in residence at the Met for another week and continue to coach with the Met’s music staff in preparation for the Grand Finals Concert with the Met Orchestra. During this final audition, they will compete before a public audience and a distinguished panel of judges for winner awards in the amount of $15,000. National Finalists receive $5,000. All travel and housing for participants at the national level is paid for and arranged by the MONC. In addition, national participants are given a per diem for each day they are in New York. Many of the world’s foremost signers, among them Renée Fleming, Susan Graham, Thomas Hampson, Ben Heppner, Jessye Norman, Samual Ramey, Frederica von Stade, Deborah Voight and Dolora Zajick have received awards from the National Council. To Reach the Metropolitan Opera Council National Audition website, click here.